– Try a Tarantula Burger at Bull City Burger and Brewery in Durham, North Carolina. They host “Exotic Meat Month” every April, and this month is tarantula meat. $30 gets you a pasture-raised NC beef burger, gruyere cheese, oven-roasted tarantula, spicy chili sauce, and a side of fries. Only 4 have been sold! – Disneyland is now beyond the Dole Pineapple Whip with the new Dole Whip Donut, available on Main Street for only $6.99. Yum! 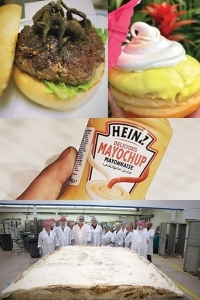 – After mega Twitter complaints and over 500,000 comments, Heinz has officially announced that Mayochup, a mashup of mayonnaise and ketchup will hit store shelves in the U.S. later this year. I believe we used to call this SECRET SAUCE! – It took 100 workers over 11 hours to create the World’s Largest Cinnamon roll last week. Weighing in at 1149 pounds and baked in a specially made 6×9 foot pan, it beat the old 609 pound record handily. Harry & David’s Wolferman’s Bakery division created the roll, and pieces were sold at the Medford Pear Blossom Festival to benefit a local charity.